Very few things will get me to buy a record quicker than saying one of the guys from The Marked Men is in the band. Not only was The Marked Men one of my very favorite bands, but every single other band that has splintered off in their wake tends to be incredible as well. Just add the fact that the particular Marked Man on this record is Jeff Burke and there is literally no way I am not buying this, import from Germany or not. The other important factor in Lost Balloons is Yusuke Okada of Suspicious Beasts and formerly of the great, great Japanese band Blotto. Combine these two songwriting titans and you are essentially guaranteed a great record. Lost Balloons does not let down. Both Burke and Okada share the singing duties on this record, but I would say that in general the sensibilities of Burke shine through a bit more. You can certainly hear echoes of his other bands in quite a few of the songs. Chances are that if you like The Marked Men or Radioactivity, there's a pretty good chunk of this record that will make you just as happy. The remaining chunk tends to slow things down a bit and play with the texture of the songs. While most of the songs on this album tend to be a bit poppier than the Suspicious Beasts records, Okada brings an element of experimentation to the party. But don't assume catchy aspects of the songs are all Burke as when Okada was in Blotto, he knew a thing or two about creating perfect two minute punk rock hits. Needless to say, I really dig this record. If forced to choose (and I will be in a couple of weeks while making my best of the year lists), I might even say I like this album even better than the stellar Radioactivity release from earlier this year. 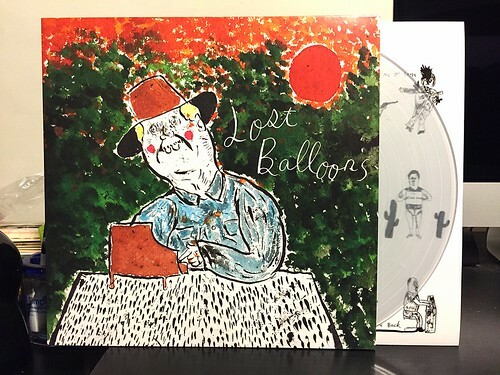 Lost Balloons is a can't miss collaboration of two tremendous songwriters. Even as a pricey import, it's still very much worth picking up. Just stumbled on your "review" site. Fantastic! And I especially agree with your review of Lost Balloons record. Jeff's songs absolutely soar off this album! Thanks for this great blog!